We're seeing a few reports from blog owners, in Blogger Help Forum: Get Help with an Issue, with blogs being inaccessible. 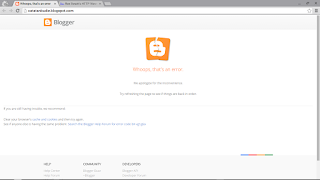 My blog can't be seen at all, it just says error when I'm trying to open my blog. I also can't edit anything, like HTML or Template. When the blog is viewed, it will issue one of several bX codes. So far, I've identified bX-3o92c2, bX-ppgc07, bX-tqn3zr, bX-v2vqfh, bX-vg1g6a. 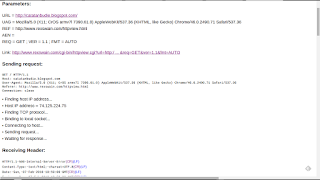 When the blog is viewed, using an HTTP trace, the trace will terminate, showing an old friend. What we appear to be seeing is multiple bX codes, being used to diagnose the various causes of the "Error 500", which has long plagued Blogger blog owners. The "bX-v2vqfh" and other errors appear to be "500 Internal Server Error". Here, we see a "bX-vg1g6a". 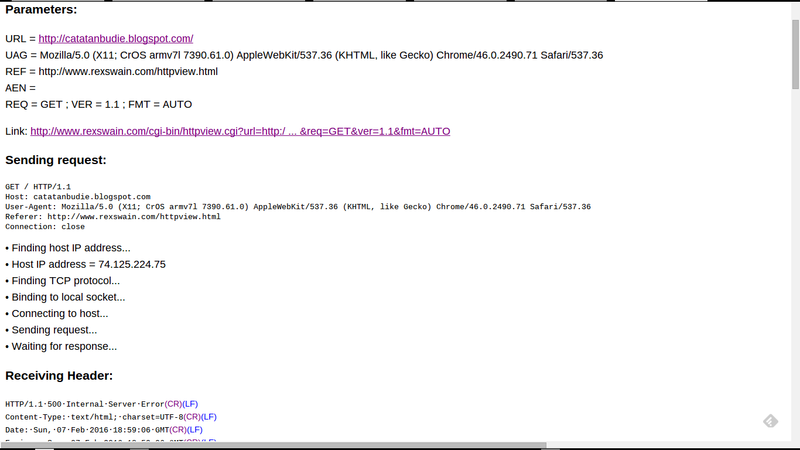 And an HTTP trace, for the same blog, shows the ubiquitous "Error 500 Internal Server Error". So, the blog owner should get a new template - or restore from backup. The simplest solution, to the "Error 500" has been to restore the template, from a recent backup - hoping that you have a usable backup. If a backup is not available - or if the blog, with the backup applied, also returns a bX code - you must get a new template. The fortunate blog owner, able to login to Blogger with the right account, will have a relatively simple task. Click on the "Design" link in the navbar. Choose a new template - or restore from a previous backup. Use "Edit HTML", and reset the post template. If the blog has a custom template, that cannot (should not) be trashed, and the Template page can be accessed, a backup before getting a new Blogger template - and a restore after - may provide relief. In either case, you will need to use the dashboard Template page - then reset the post template, using Template "Edit HTML". In some cases, the dashboard can't be accessed. In this case, we must (with some effort) access the Template page, directly. Possibly a little effort may be required. Extract the BlogID, from the navbar "Design" or "New Post" link. Build a Template page access URL. Access the Template page, using the direct URL. If the navbar link can't be used, a little more work is involved. Find a cached copy of the blog, before the template broke. Extract the BlogID, from the cache source code. Finally, if possible, recall what changes you made, immediately before the problem was observed - and avoid repeating those changes. Note that some blogs absolutely won't provide access to the Template page - but they may, to the Template Editor aka "Edit HTML". 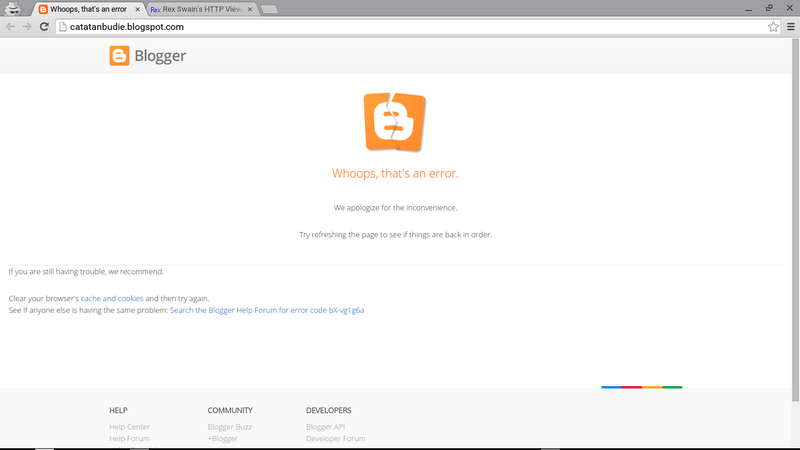 It appears that #Blogger Engineering, in an effort to diagnose the annoying "Error 500 Internal Server Error", has recently activated or added a series of bX codes - which are being reported by various blog owners. We were some time ago advised to have the owner get a new template, when encountering the "Error 500". Yeah, but is it being bloody fixed? I have a blog that disappeared and I've tried all their fixes. Nothing. It's not fair. But is it being fixed? It is being fixed - though not immediately or soon enough. You have 7 blogs, listed in your profile. Which of the 7 disappeared? Hope to hear back from you, maybe we can get you sorted.